The makers of Bahubali 2 have made an interesting announcement regarding its conclusion part. That is, introducing Virtual Reality effects in the Movie. The first look of Bahubali 2 is going to release the highest quality of Virtual Reality Effects. 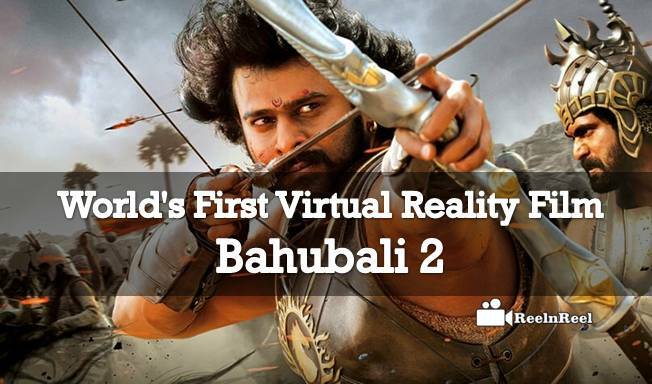 After they have announced, Bahubali 2 VR has become more popular in the entertainment circle. What does this VR exactly means the audience can live and Experience in the world of Bahubali with latest technology and gadgets. Virtual Reality is the one of the trending Technology in the digital media world. VR place a key role to experience the 3D world. Instead of sitting in front of the screen user can experience the Virtual World of the Movie. VR is the most trending and next recognisable technology. This computer technology is transforming into senses like hearing, visibility ,feel and experience. Rather than locating with the physical environment, this 360-degree camera turns your head and eyes to look and feel the environment with senses. This 360 degree covers entire surrounding environment in the movie. The leading VR technology concepts like Google Cardboard, Samsung Gear VR, HTC Vive, Aukey VR Headset and Merge VR.From these technologies, we can experience and enjoy the world of VR in Baahubali 2. The virtual reality of Bahubali 2 can be experienced while watching it on mobile devices which gives the real-time feeling of being on that sets. It can do by downloading the Google Cardboard app on our smartphone, and this will scan the code available through which our mobile get permission to access the VR of the Bahubali 2 movie. This is a stunning world movie which has launched the unbreakable nameplate in the history of the film industry in the category of Telugu film. The arrival of this movie has launched the challenging spirit in other movie industries and let us see is there any movie coming to beat this Bahubali. Starting with this movie Let’s hope many more Indian movies come up with more innovative technologies like VR.